Can you see all the people in the crowd sitting there just to know more about you? Thank you so much for coming! I am very excited, because I am sure we will have a great time together, today. I surfed your brand new website – which you can find in Marta’s bio at the bottom of the page – and I think it is great! Good luck with your business! But, what you think? Are you ready to answer my questions? As you know, I am going to ask you six sets plus a Bonus Qs section of questions covering your personal profile, and, today, your interview focuses on the first three sets – the easier questions. Then, on Thursday, I will ask you the remainder of them related to tastes, expectations, and much more. ▷ I am a freelance EN/FR>ES Translator EN<>ES Sworn Translator. My areas of expertise are: librarianship, medicine and architecture. ▷ Birth place and city I live now: Pamplona (Spain). University studies in Granada (Spain). Worked in Madrid (Spain). ▷ Depending on my mood but I clearly prefer red and green. ▷ It depends… I like both. If I need to relax a lot, definitely sea. ▷ Definitely namastay in bed. I hate getting up early. ▷ In the school I learnt to play the recorder. I specially love listening to brass bands, but I also like listening to violins and pianos. ▷ A book and/or my e-book. I also have to look for places to dance swing. ▷ Ajoarriero (a cod speciality from the Spanish region of Navarre). ▷ I only like cooking if it is for more people; if it is only for myself, I don’t. I don’t really have a specialty, I like cooking new recipes every other time I gather with people..
▷ I hate running but I love dancing lindy hop. So if you ask me if I want to go to a swing festival I would say… YES!! Let’s go right now! ▷ Ludo  I don’t really play anything else. ▷ I think it is a very difficult question to answer but one of my favourites is El tiempo entre costuras by María Dueñas and the last one I’ve read is La analfabeta que era un genio de los números by Jonas Jonasson. ▷ No, I am not. Marta, thank you so much for your answers! I didn’t know about the existence of a board game called Ludo before talking to you. I love board games, but I missed this one. Good to know! I have to look for more information about it, so we could play it next time we will share a flat. Well, our time is up! I hope that our readers enjoyed the first part of the chat. But, don’t worry, we will be back on Thursday with the second part and another great time with Marta Prieto! Follow me and Marta to catch up with the latest news! Who’s Marta? ▷ Marta is a Spanish-English Sworn Translator by the Spanish Ministry of Foreign Affairs, a freelance English and French to Spanish translator since 2002 and an Information Specialist who has worked in different media and consultancy services. And a lindy hopper! 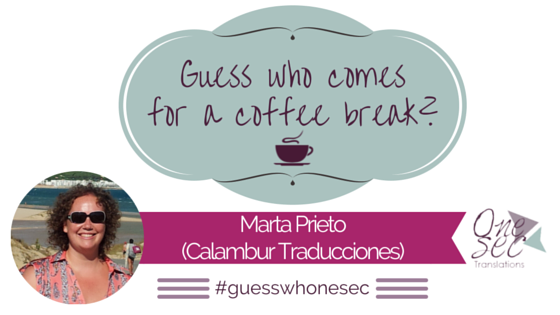 You can find her also behind the name of Calambur Traducciones. Her areas of expertise are: librarianship, medicine and architecture. You can find her on social media: Twitter, Facebook, Google+ (Personal and Professional account), and LinkedIn.